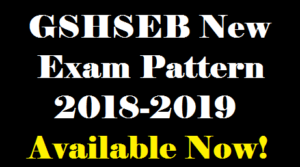 GSHSEB New Exam Pattern: Gujarat Secondary and Higher Secondary Education Board have done major changes in test pattern today. Now, more theory based questions will be included in the question papers. BN Rajgor, GSHSEB Joint Director confirmed the “much-needed alterations” in a press release statement yesterday. Exam pattern changes will only be implemented at the beginning of 2019-2020 session. Alterations have been observed in all four upper standards for total affiliated schools i.e. Class 9, 10, 11 (Science) and 12 (Science). Board of a controller of examinations and other experts has concluded with the fact that overall pass percentage or overall results may decline (by percentage). But, as per Rajgor’s statement, who was District Education Officer of Bharuch earlier, the board was worried about crumbling writing skills of Gujarat Board students. MCQs based question papers are beneficial from the point of scrutinizing authority but alters the writing habit of students a lot. Total 50 Marks of Practical Exams in PCB (Physics, Chemistry, and Biology) subjects. Only 20% MCQs (Multiple Choice Questions) and 80% (Theory Based) marks weightage will be there in 100 marks board exam question paper. Internal evaluation marks weightage earlier was 70-30 which has now been changed to 80-20. MCQs will only be at 16 Marks. Also, total 80 marks of annual exams will be divided into 64 marks of short, long and essay-related questions. First and second unit test will be of 50 marks each. Five marks each will counted for subject enrichment activity, notebook deposition, 2nd unit, and 1st unit, totaling to 20 marks of internal evaluation. While remaining 80 Marks will be of Annual Papers (80% theory based and 20% objective-based questions). When asked to principals of various schools, positive reviews were marked in various statements about the decision. Angana Mankad, Principal of Amrit Jyoti High School said,“It will cut down on cheating as it is easier to copy MCQ answers. Now, only those students who study hard will score better.” Be in touch with www.allindiaroundup.com for the latest news of GSHSEB.